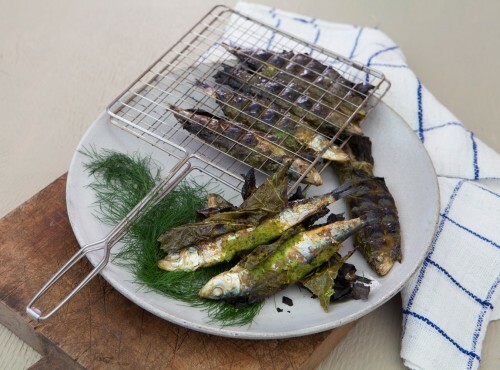 This marinade is ideal for sardines that are to be grilled quickly over the coals of a barbecue. I enclose the wrapped fish in a small double-sided grill I bought in Vietnam and place the tightly closed grill directly on the coals. Preheat barbecue to very hot. Work all ingredients except vine leaves, sardines and lemon wedges to a smooth paste in a mortar or food processor. Rub sardines inside and outside with paste. Wrap each fish in lightly oiled vine leaves. Grill on barbecue for 2 minutes each side, turning once only. Serve with lemon wedges. The charred vine leaves are delicious to chew but should probably not be swallowed. Variation For a very Mediterranean touch, throw common fennel onto the barbecue to add its aroma.